I hate missing SYW posts but somehow I got so busy with an author rebranding and major writing that I missed a week because these questions are for Week 28. Watching a caterpillar outside in the yard while my mother and her friends played mahjong inside the house. I was probably about four or five then. I also remember being in a hospital as a patient and thinking it was so cool that the bed was so high I couldn’t jump down. Can you believe it? I finally read The Lorax by Dr. Seuss for the first time??? Yep, my little guy went to the library to get his very own library card last week and came home with two books, Arthur Meets the President by Marc Brown, and The Lorax. And I got to read it out loud to him. Wow, but the book is deep, and so true and so profound I had to snap a picture of that last page. What is the longest you have gone without sleep? Probably 24 hours, when I had to work at a top secret video game event 60 miles away, and it started at 11 pm at night all the way until morning. Why I didn’t think of sleeping before I went to work, I have no idea, but the adrenaline from being there and watching all the gamers sit and play for hours – and coffee – fuelled me through the whole gig. I don’t know about you, but I love my bed too much to go without sleep any longer than 18 hours now. My ongoing Wattpad novel, In Love With A Young Man, got featured on Cosmopolitan last week and while there’s not much fanfare there, I didn’t realize just how much of a big deal it was to me still, like #screaminginternally kinda big deal. The last time my stories got any attention was this time last year when RT Book Reviews picked Collateral as one of the best romances for July. I’m looking forward to going through a seamless author name/platform transition from Liz Madrid to Liz Durano while finishing up my current novel. Rebranding can be such a pain but now that I can see what a pain it can be, I should have just gone with some crazy-sounding pseudonym instead of a real name, in this case, my maiden name. Eh, but it is what it is. But wait! I could have just changed it to Morrighan Muse! Hard to believe but I actually do these things and forget to post them. When I remember, it’s a week too late – even more – and so the posts just sit in draft mode. But I’m hoping to do it this week, which will probably be the first for 2016. Yes, it has been so long because I took almost six months off wandering the halls of Facebook trying to be a romance author marketing her books (it was horrible, thank you for asking – I have to come to realize that I am primarily a blogger). So, where was I? Oh, right, Share Your World, Week 26. What’s your most memorable (good or bad) airplane flight? It’s probably a tie between sitting in First Class on a flight to New York next to a retired violinist who worked with Isaac Stern, and years later, on another flight to New York, sitting in Coach next to a neurologist (“I’m a neurologist, not a urologist”) and talking about recent studies he was doing on the correlation of migraines and temporomandibular joint syndrome (TMJ syndrome) among people who used to wear orthodontic braces when they were younger, and he was open to exploring the benefits of massage therapy on said migraines and TMJ syndrome. Both of them made me wish the flight went longer than they did. How many bones, if any, have you broken? Reading: A cozy mystery ARC (advance reader copy) of Drop Dead Handsome by M.C. Scott. Here we go for Week 26! Definitely driver! I’m a terrible passenger, and have many a time, driven the entire way to and back simply because I prefer to be in the driver’s seat. Now as far as my passengers go though, I don’t know how they feel about that. It depends on the opera tickets. Carmen, definitely go and see it, and anything with Placido Domingo though he’s more behind the scenes these days. And even if I could sell them, I’d just grab a friend and make sure we indulge in a few glasses of wine before hand and just have a great time. The wine glass is always half full. Which would you prefer: a wild, turbulent life filled with joy, sorrow, passion, and adventure–intoxicating successes and stunning setbacks; or a contented bordering on happy, secure, predictable life surrounded by friends and family without such wide swings of fortune and mood? I’ve had my share of the former – that wild, turbulent life filled with highs and lows of joy, sorrow, passion and adventure (though not the bungee jumping, rappelling off a side of the building kind), complete with intoxicating successes and depressing setbacks that I think I’m in the latter now, surrounded by family and friends (new ones now that I’ve moved away from the beach friends and have kids, so play dates are the in thing for me) and trying my best to have a stable environment for my 5-year old on the spectrum. Today, it was a trip to Pretend City, where basically it is a pretend- city, with a post office, police and fire stations, a supermarket, library, park, and so much more. The little guy had so much fun he got home, had a tantrum (because that 1-1/2 of running around exhausted him) and is now passed out on the bed and I’m here writing – well, I should be writing my novel but I’m taking a break to share my world first. Pretend storm drain, pretend street, pretend planting garden, pretend grass. Nothing pretend about being a mom though. I can’t believe it’s been weeks and weeks since I’ve done the Share Your World challenge (or rather, posted my answers on time – they’re all in my drafts and way way late to post them now)! But fear not! I’m on time this time! What did you or did not like about the first apartment you ever rented? When I left home, I rented one of my grandmother’s apartments together with my two brothers, who left home at the same time, with the reasoning that I couldn’t possibly live alone and be safe. Forget that the apartment was 75 or so steps away from our house, but that was apparently as far as my relatives wanted us to go and still give us that illusion of being on our own. It was a one level apartment with two bedrooms and it was right next to the sewer (and in the Philippines, when I saw sewer, it’s like an open canal, which was what we called it – cán-al). And because the Philippines is pretty much a tropical country, where there are two seasons (hot and hotter), houses were pretty much wide open. You had cut-out cement windows to let the air filter in and all that. You could put chicken wire to prevent rats (yes, I said rats) from coming in, but they still found a way to get in. So, what I didn’t like about that apartment were the rats – or this one particular rat because somehow they all looked the same – that would make it into the house, especially at night. In my mother’s house, we had over 20 cats and dogs combined so rodents were pretty much non-existent. But in this little first apartment – with no pets because my brother had had enough of pets – even the trip to the bathroom at night was pretty much a risky undertaking, if you didn’t want to risk having a rat run past you, and even step all over the tops of your feet in the process (yes, it’s a memory). What kind of art is your favorite? Why? While I love paintings, I’m always awestruck by sculptures. To sculpt a thing of beauty from a piece of marble or a rock takes incredible skill. Sure, these days, they’re pretty much aided by computers sometimes, but I don’t think that was the case back in the time of Da Vinci and Michaelangelo. There were no 3D renderings to help them with their creations. I also love looking at clay sculptures and one of my favorites sculptures is Edgar Degas’ Little Dancer of Fourteen Years done in beeswax and found objects, including her tutu. I can just stare at this for hours at the Met, which I will do this summer. How many siblings do you have? What’s your birth order? I’m the second of three children, and the only girl. That doesn’t mean I was the favorite though. My older brother is way more charming than I am and has way more fans that I ever could have, and my younger brother is just way cuter. Even now. I also have an adopted brother, so that would make, in non-birth order kinda way, three brothers. So I’m starting Cee’s Share Your World in February, with Week #5. I love shopping, though I hate crowds. So I love shopping on the internet, and on my phone where shopping apps are plentiful, I’ve got everything I want – whether I need it or not is a whole different issue. But then I also love going to the park, and as long as I have my phone, I can shop if I wanted to. I remember in high school when Keds were the rage. And because my mother thought they were horrendously priced, she never bought me one. She’d buy me the girly shoes, just not Keds. So I bought myself the local version without the label. And I wore that till it wore out and with the extra money, bought another pair. I even painted it different colors using markers. Funny thing is that people usually thought they were Keds anyway from the front, since the label sits in the back of the shoe. 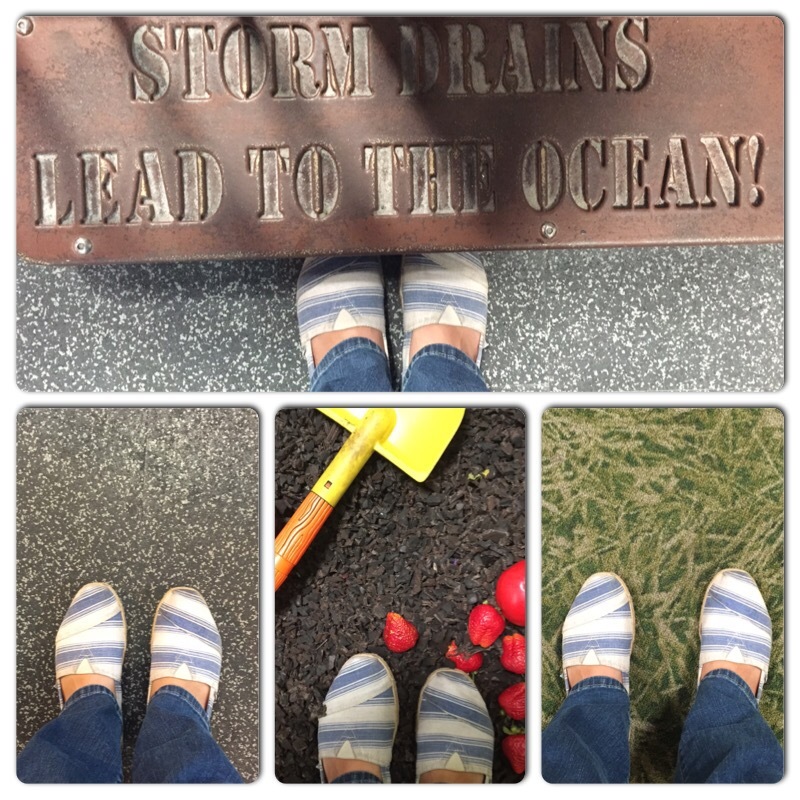 For the last three years, I’ve been into Toms shoes. They’re pricey as heck (I can get three pairs of cheap ones for the price of one) but I love that for every shoe I purchase, Tom gives one away. It may be all hype, but I love the overall premise, and their designs rock! There’s nothing better than to slip on my Toms whenever I go out in just about anything. I even included it 2 years ago in one of my story challenges here, with my character taking along an extra pair of Toms shoes to go with her high heels when she got tired of standing in them. I’ve gotten locked out of my house a few times and because of that, we have an extra key hidden somewhere. But before I knew where the extra key was hidden, I got really good at slipping through our window and realizing how useless those sliding window locks are and how nothing can beat a simple stick that costs nothing. Of course, with the stick there now, I just have to use the spare key and save myself the trouble of breaking a leg in the process of breaking into my own house. I’ve been described as a nut and when it comes to peanut butter, I love it nutty. So, yes, I prefer eating foods with nuts. One of my stories was selected for a campaign that starts today, and last week, it was a wonderful feeling to finally let the manuscript go and leave it with Swoonreads for judging whether it’s worth publishing or not. For the week coming up, I’m looking forward to writing 10k words for my upcoming novel. And sticking to writing on this blog regularly again. A week late sharing my world with you all, but here it is! Once again, thanks to Cee for the wonderful questions! It’s been a crazy week for me, with my teaching schedule in summer swing again and the little one with only four more days of preschool before he’s unleashed to the world for the summer (one is never prepared for that!). I’m also at 95K words of a modern-day novel that I need to finally wind down – so my mind as always is elsewhere but where it’s supposed to be. Anyway, for now, it’s here, sharing my mundane world to you and hope that you join in, too! If you could make a 15 second speech to the entire world, what would you say? Life is what you make of it. Don’t wait to say what you want to say till it’s too late – do it now and love often, if not always. Ever since I was a little girl, I’ve always been enamored of the British and Irish isles, whether it’s the bustling cities, high cliffs along the chilly coast, or the rolling hills and valleys where one stumbles upon standing stones of the past. I love listening to the accents rolling off people’s tongues, immerse myself in the stories of the Celtic gods and goddesses who walked the earth, and wonder just how such a world smells like. Ikea. They have beds and everything I need to keep myself comfortable and even a cafeteria where I can gorge on Swedish meatballs all weekend. And when the weekend is over, I can get up and leave. Unfortunately they don’t have any books – other than those fake ones – which would probably make my weekend stay a living hell. I’m not a boat person at all, yacht or whatever you can throw my way. But should I receive a boat – though a yacht is more my thing – then it’s got to have only one name. Mischief Managed. It’s time to share my world again! My full month of vacation of teaching is winding down and I’m feeling a bit sad about that – but at the same time, it’s nice to get to teach topics I actually enjoy teaching. I was actually hoping to finish a novel that I started writing, but I guess it was too ambitious of me to think I could finish it in a month. But I have 5 days more to go, so you never know! So anyway, here we go! I’d like to travel back to the time of the industrial revolution, to see how northern England changed to become this hub of mills and other manufacturing towns. It has to do with my reading of Elizabeth Gaskell’s North and South as well as her other books set in that time period, where her husband ministered to the working masses and she got to see first-hand the effects of industrialization upon the people. I wrote about Gaskell on my everything-else blog here. This must be a trick question – don’t mind the seriousness of the first wish though. Or better yet, just skip to the third question. I wish to have been born among the race of colonizers (Spain, which colonized the Philippines and Mexico; England, which colonized India, etc.) – just so I could see how it feels to be one of that skin color. I wish for a world where people were kinder, countries were more mindful and no one was better than the other. I wish I were a better mother. Just water, thank you very much. I fear a world where water will be difficult to come by. In fact, for my birthday in a few days (which Mr. M will forget for the 7th year in a row), my wish is to raise money for charity:water. I had set up the giving page last month and unfortunately forgot to link it to anything on this blog (bad bad me!). So since this question came at just the right time (and reminded me of the page I had set up! ), if you’ve got a few pennies to help provide safe drinking water in countries like Mozambique, Haiti, Malawi, Bangladesh and Cambodia (to name just a few), here’s the link to learn more about charity:water and how you can help. HANNIBAL. I am crazy for this show. I am mad for Mads Mikkelsen and the writing is impeccable, so complicated at times and I like the horror aspect of it. When this show comes, I shoo everyone out of the living room and watch it with hands covering my eyes. I love how they have a food stylist who fashions all these interesting human-looking meals that actually look so good and blogs about it here. Tonight is the season finale, too, so I suspect I will be suffering from withdrawals. GAME OF THRONES – I have a confession. I’ve only watched this in bits here and there from the beginning but I am not offended by spoilers, so I got caught up really quickly in time for season 4 – which unfortunately has its finale next week. I love George R.R. Martin’s writing and it’s interesting to see how his work is adapted for TV. I am strangely attracted to Lord Oberyn Martell and love the scheming Petyr Baelish (may you never turn your back on this man if you value your life) and of course, Peter Dinklage’s Tryrion Lannister. Ack! I’m late again! This was supposed to be posted last week, but it seems I’m running a week late in sharing my world, but better late than never. Thanks to Cee of Cee’s Photography for such a wonderful prompt. I’m sorry. Is this even a question I have to think about? Shopping, of course. Then I can go to a park when I’m all done. What is the highest score you’ve ever made in bowling? Actual or virtually played. Name the foreign countries you’ve been to. Just a handful. Philippines, Tokyo, Hong Kong, Mexico, and the US. Describe your own outlook on life in seven words or less. Here we go – sharing my world with you, week 18. Thank you, Cee, for the wonderful questions every week! As usual, I’m late in posting this although I had answered it a week ago – and promptly forgot to post. Oh, by the way, I changed my theme temporarily because something wasn’t working with the other one – as much as I loved it. The left sidebar when viewing the main page wouldn’t show up, which made it seem weird. But it did show up when one clicked on the individual posts. Go figure…anyway, thought I’d have this on for now, and see how it goes. That would be my iPhone, I guess. Although in lieu of anything electronic, it would be my Alunsina leather journal, and a pen, of course. The mind. I think the body is just amazing. We all originated from one cell that became two and so on. Our body’s cells are always doing what it does best to keep us working in tip top shape – and then there’s the mind, which can adapt to certain circumstances (to a point), has been found to regrow its cells, and so much more. Neuroplasticity – that’s where it’s at. Or maybe I just wish I could bend metal with just my mind, or read other people’s minds, controlling their actions and their thoughts, who knows? After all, X-Men does open this coming weekend! My life has been anything but contented bordering on happy, secure, and predictable although these days, it sure looks like it – which makes this question a tough one for me to answer because I want a balance of both. I’ve been through the turbulent life with their extreme ups and downs and there’s something that can be said about that – never a boring moment. So, can I have a balance of both? What are your favorite spices? Chinese five-spice powder is not exactly a favorite but it’s one of my favorites, and the only one I can remember off the top of my head that is a spice – or a collection of five spices. It’s a blend of star anise, cinammon, cloves, Szichuan pepper, and fennel seeds and when brushed with sesame oil on chicken wing drumsticks (without the wing tip part), wrapped in foil packets and deep fried or broiled, is just amazing! The Hungry Escavator does Chinese Five Spice chicken drumsticks right!